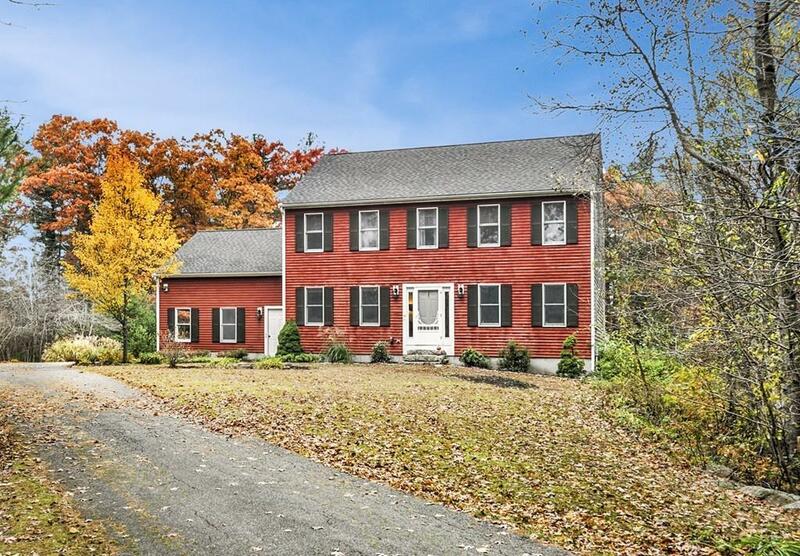 Charming colonial tucked away down a winding driveway at end of cul-de-sac offering 2.47 acres of privacy. Kitchen with generous center island with seating and second sink with an open concept flow into family room. Formal living room has a multitude of uses as office, playroom or whatever suits your needs. Large deck off of kitchen overlooks a massive and completely private back yard. Dining room with beautifully accented ceiling off of kitchen. Master bedroom includes a private bath and spacious walk-in closet. Three other generously sized bedrooms. Walk out lower level is partially finished giving you additional space for entertaining or a great play space. Great storage shed. Central air and newer roof. Freshly painted interior. Nothing to do but move in. Welcome home, welcome to Pembroke! Listing courtesy of Anne Fitzgerald of William Raveis R.E. & Home Services. Listing provided courtesy of Anne Fitzgerald of William Raveis R.E. & Home Services.